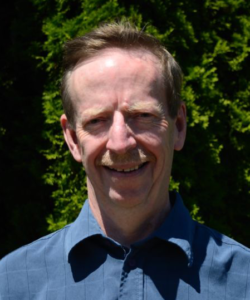 Carl received his BSc in Psychology from the University of British Columbia, his DVM and MSc in Herd Medicine from the University of Saskatchewan, and his PhD (with distinction) in Epidemiology from the University of Guelph. He has been on faculty in the Department of Herd Medicine and Theriogenology at the University of Saskatchewan, served as Chair of the Department of Population Medicine at the Ontario Veterinary College, and served as Interim Dean at the Ontario Veterinary College, and Associate Dean (Academic) at the Faculty of Veterinary Medicine in Calgary. Carl is presently Professor of Veterinary Epidemiology in the Department of Ecosystem and Public Health at the University of Calgary. He is a member of the Canadian Veterinary Medical Association and the Society for Veterinary Epidemiology and Preventive Medicine. Carl has been with the Centre for Coastal Health since 1998. His administrative experience and project management skills are foundational to his present roles of President and Director at the CCH. He provides the CCH with expertise in research design – he has taught a graduate course on the subject for more than 20 years and has managed many research projects during that time at the university and with the CCH. His teaching skills and interest in developing engaging learning programs provide the CCH with expertise in developing and facilitating workshops that help organizations find solutions to health and disease challenges they face. Carl’s project work with the CCH since 1998 has enabled him to pursue his long-standing interest in helping people explore ecosystem and public health issues that arise at the interface of animals, humans, and the environment. Some highlights of Carl’s recent work with the CCH include: 1) designing and facilitating different program planning workshops in foreign animal disease preparedness involving industry and multiple levels of government; 2) managing a review of early warning and rapid alert systems for food safety and facilitating a subsequent FAO-sponsored workshop on how such systems could be developed for developing countries; 3) leading a review of management alternatives to antimicrobial use in feedlots; 4) developing methods to collect and visualize animal movement data to explore how these movements may assist the introduction and spread disease to new areas; and 5) in concert with key collaborators, using statistical modelling approaches to better predict animal growth in feedlots, to develop a sustainability index for shrimp farms in Sri Lanka, and to explore the role of specific pathogens and environmental variables in salmon return variation.